BEIJING, May 16 (Xinhua) -- Chinese President Xi Jinping on Tuesday suggested docking the Belt and Road Initiative with the European Investment Plan in order to inject new momentum into China-EU ties. 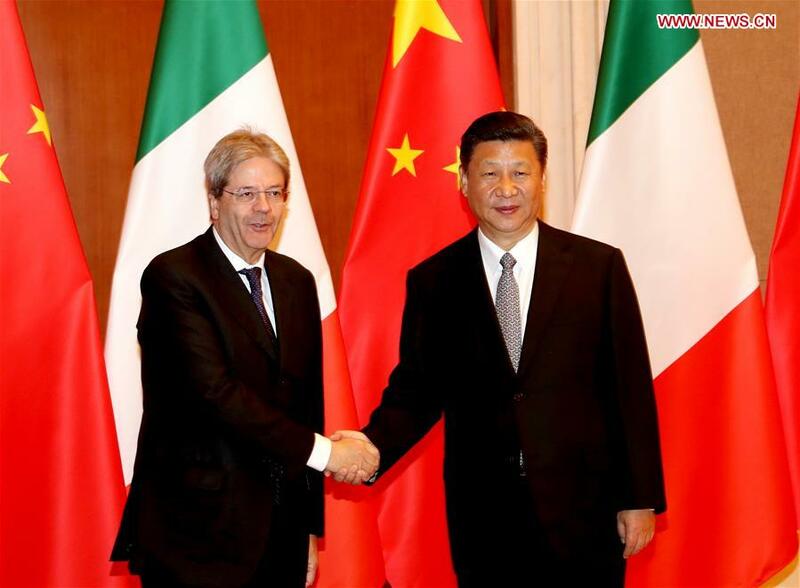 Xi made the remarks when meeting with Italian Prime Minister Paolo Gentiloni after the two-day Belt and Road Forum for International Cooperation ended on Monday in Beijing. Noting that both China and Italy boast ancient civilizations, Xi said the two countries have been connected by the historic Silk Road. He commended the frequent visits by leaders from both sides and close exchanges between officials at all levels, saying China is willing to work with Italy to further advance bilateral ties. Both China and Italy are key members of the international community, Xi said. He urged the two countries to maintain the current momentum in high-level exchanges, as well as close contact between governments, legislative bodies, political parties and regional authorities. The Chinese president highlighted two-way investment, construction of industrial parks, e-commerce and innovation as areas for further cooperation. China welcomes Italy's participation in the construction of the Belt and Road, and supports cooperation between the two countries in port management, shipping as well as ship building, he said. Beijing is willing to maintain communication with Rome on major international issues, and hopes Italy can play a positive role within the European Union in order to safeguard the development of China-EU ties, he said. For his part, Gentiloni said the just-concluded Belt and Road Forum had sent a positive signal to the world economy and international trade. Italy is willing to participate in cooperation under the Belt and Road framework, particularly in the field of infrastructure, and to strengthen collaboration with China in areas linked to agriculture, culture, economy, education, public health, technology and tourism as well as small- and medium-sized enterprises, he said. Italy sticks to the one-China policy and will play its role in promoting EU-China ties, Gentiloni said. In a separate meeting with Gentiloni, Chinese Premier Li Keqiang also hailed the traditional friendship between China and Italy, while expressing the hope that both sides make full use of regular meetings between the Chinese premier and Italian prime minister to bolster political mutual trust and step up cooperation in key fields. Both sides should work to help bilateral ties reach a new level by 2020 when Italy and China celebrate their 50th anniversary of diplomatic ties, he said. Noting that China is implementing an innovation-driven development strategy, Li said China is willing to work with Italy to enhance collaboration in innovation-related fields and step up cooperation between small- and medium-sized enterprises. China is willing to take part in port infrastructure building in Italy to improve connectivity between China and Europe, he said. Gentiloni said Italy welcomes Chinese citizens to visit and study in the country and pledged to make visa applications easier. A series of cooperation documents covering agriculture and finance were signed after the meeting.